Menstruation, typically a taboo subject in our culture, can be a rich source of information about health and well-being for both women and their practitioners. But what is normal menstruation? Join herbalist Elaine Sheff of Green Path Herb School to take a deeper look at how to interpret the fertility cycle by creating a menstrual map. This class focuses on hormonal balancing, as well as addressing herbal actions including reproductive antispasmodics, emmenagogues, hormone balancers, phyto-estrogens, progesterone encouraging herbs, uterine astringents, and reproductive tonics. *This class was recorded at the 2015 Midwest Women's Herb Conference. The author of several books on herbal medicine and healing, clinical herbalist Elaine Sheff has been passionate about sharing herbal knowledge for over 25 years. Her latest book isNaked: Botanical Recipes for Vibrant Skin and Healthy Hair. 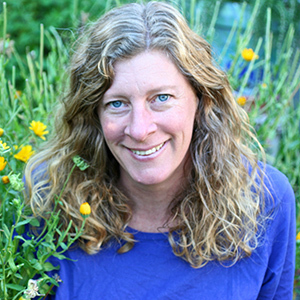 Elaine is the Co-Director of Green Path Herb School, located in Missoula, MT, where she strives to inspire and empower students and clients to remember their connection to the earth, the plants and their own healing process. She is a professional member of the American Herbalist Guild and teaches workshops both nationally and internationally. As a certified Instructor of the Natural Family Planning and Fertility Awareness Methods, Elaine has helped many couples to avoid or achieve pregnancy naturally. Elaine has written numerous articles about her family’s journey with epilepsy and a special needs child. She has written for publications including the Journal of Medicinal Plants and their Applications, Mamalode and Aromaculture magazine. You can often find her bent over an herb in her garden or marveling at small flowers in mountain meadows with her husband and sons.